Applications are now being accepted from returning second year students in the Photojournalism Program at Loyalist College , for the 2012 Shaun Best Scholarship. 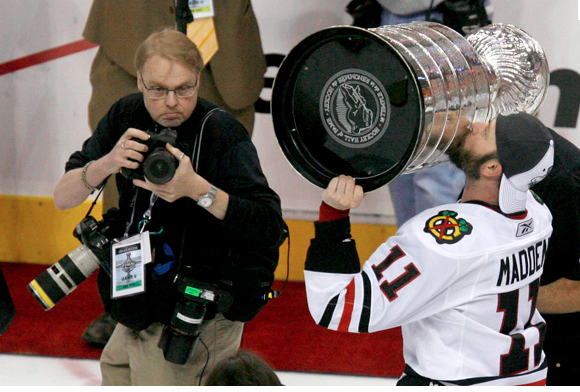 Shaun Best doing what he did best, covering NHL hockey for Reuters. Spearheaded by Barbara Davidson, a Pulitzer prize-winning photojournalist and friend of our program, Shaun’s colleagues and co-workers have decided to remember Shaun by helping a second year Loyalist College Photojournalism realize his or her dream too. The application will consist of a portfolio of no more than 20 jpeg images. Picture stories or multi media count as one of the 20. demonstrating your skills so far, and a letter to the judges, giving them an understanding of who you are, why you want to be a photojournalist, and why you are deserving. Financial need may be considered in this letter. Deadline for this package containing a CD of your images and your letter is Thursday October 4, 2012. Submit your envelope to Frank at his office. 1n3b no later than 2 p.m. on that date. Final selection will be made by Barbara Davidson and committee.